Saint Patrick's Day is an Irish bank and public holiday held on March 17th every year, relating to Saint Patrick who made all the Irish become Catholic CE 400 by using shamrocks... so we are told… but historians agree that the man who did this great conversion by bringing the Catholic religion to Ireland was called Palladius (who was married with children), he was most definitely not named Patrick, nor was he Irish and there were no snakes in Ireland for either he or Patrick to eradicate and neither he or Patrick ever mentions shamrocks. As the current calendar is less than 250 years in use it cannot be used to establish dates in the early medieval period so it is highly unlikely that he died on March 17th 460ad. So, what is his true story? The saint called Paddy/Pat/Patrick was not Irish. Historians agree that Patrick was born in 373 CE giving two possible locations – Dumbarton in Scotland or on the west coast of Roman Britain i.e. Wales. The Romans are said to have exited Britain by 410 CE. Patrick eventually retired to Glastonbury, England, where he died at the age of one hundred and eleven on the 17 March, 460 A.D. These dates do not add up; 460 – 373 = only 87 years of age, so was he 87 or 111 years old when he died? It depends on which spin you read… The man who is so well known to us as St Patrick was originally called - Maewyn Succat or Magonus Saccatus Patricius. His father Calpurnius, had been a deacon and a decurion and his grandfather was a priest, his mother was called Conchessa. Pope Celestine gave Maewyn Succat or Magonus Saccatus the name of Patrick. The Pope gave him the mission of bringing the Catholic Faith to Ireland. He gave him many relics and other spiritual gifts, and gave him the name "Patercius" or "Patritius". This name is derived from two Latin words pater civium meaning the father of his people. The designation is like Patricus, a Latin / Roman upper class name similar to Patrician. Rome had three classes – Patrician, Plebeian and Paganus. Patrician was the ruling class, while Plebeian was the working and middle class leaving Paganus to be the name / rank for all those who did not obey the rule of Rome. We are told that he was taken into slavery at 16 years of age and sold in Ireland where he worked as a sheepherder for 6 years but sheep did not exist back then – so he would have been a goatherder... It was during his time as a slave sheep / goat minder that he began to have religious visions. These visions re-enforced (so we are told) his Catholic Faith. During one of these visions he heard voices that told him where he could find a getaway ship. He escaped, went to France where he became a priest and later on he returned to France to become a bishop. He also burned many Druid books if his confessions are to be believed. 150 Druid Books were burned and on Tara he caused a competition with a Druid Book and the Bible to be thrown into a barrel of water – needless to say the Druid Book sank proving that the Bible was a better book. But hang on, we are repeatedly told that the Druids did not have books! He also prayed for an old Druid to die – we are told that Arch-Druid Lochru was lifted up high in the air but Patrick knelt in prayer and the Druid fell and was dashed to pieces upon a rock. St Patrick is said to have caused the murders of almost eight hundred Druids. The folk tale of a she-beast called Caoranach that he banished to an island in the middle of Lough Derg in Donegal is accompanied by the tale of a woman who followed him very closely and that after he had banished the she-beast, this woman was never seen again... The pilgrimage today to the retreat centre on Lough Derg is a trick for the followers of this St Patrick religion because it is on the wrong island… the Pagan cave temple on the island that the Catholic Church tried to use was not hospitable to them so them moved their Purgatory to another island in the same lake and achieved some commercial success for a while. There is a story about Patrick and two Pagan Celtic Princesses – “He also caused two young princesses to die at the Ogulla Well, aka Cliabach Well. Here he baptised Eithne and Fidelma, daughters of King Laoghaire of Tara. They were attending the great Druid school of Cashel Manannáin at Rathcroghan. The two sisters were washing when St. Patrick came upon them. He told them that the only way to see God is after death. St. Patrick then baptized them after which they both died. Not a good plan – this seems to be a cover story for something else.” We are led to believe that Eithne and Fidelma died so they could enter heaven. A church in Tulsk nearby is named after them. Hang on a bit! Two young high-status female Druí Daltaí (student druids) suddenly died after a ‘blessing’ by a christian priest… only a few miles from their Druid school? Ah come on – why would two Pagan princesses - Eithne the Red and Fidelma the Fair, studying at a Druid school (under royal patronage) suddenly want to be spouses / wives of Christ? Why are we told that these two female Druids became Nuns who were automatically brides of Christ in a polygamous marriage that could never be consummated? Why were Virgins marrying a dead man? How come they died after eating Patrick’s sacrament? Maybe the story needs an outside perspective – two young Princesses: Eithne and Fidelma who were being fostered (living with high status as guests) with Druids Mael and Coplait were attending the great Druid school of Cashel Manannáin at Rathcroghan attended by their armed guards were at the Cliabach Well washing themselves. They are claimed by the church as being among the first converts by Patrick to his tradition. The druid school they were attending is named after the Gaelic version of the sea god that is best known today as Neptune. The school is still visible as raised banks on the west side of Glenballythomas at Cruachan / Rath Croghan near Tulsk in Co Roscommon. At that time of Eithne and Fidelma, daughters of King Laoghaire of Tara death by baptism the native laws aka Fenechus / Gael Law (aka Brehon law) would have demanded King Laoghaire of Tara seek recompense from who ever was responsible because under Celtic Laws 'whether by accident or by design' his two daughter were dead! But shush! the story was written long after it was supposed to have taken place and really it is just more fake church history. The designation or title of ‘saint’ for this Patrick has never been acknowledged by any of the Roman Catholic Popes. The Irish church tells us that it was by public acclimation that Patrick got this title. Yet this is just spin. He was called Naomh, which means holy, just as Brigid was holy (ie Naomh) but by being in control of the native language the church changed the meaning of many words and Naomh changed from being holy to being saint. When this happened, no one could say anything because the church wielded the power of life and death and social ostracisation / excommunication against its detractors. Today, we are told that the head of Patrick, like that of Columcille and Brigid rest in a Jesuit Church in Portugal. Their 3 bodies are buried in Downpatrick in the North of Ireland. Stories claim that when he was 60 years old, St. Patrick choose to go back to Ireland, the land of his slave years - to give the Gael the Catholic word. This was a very advanced age for the time and today the equivalent age may be near 90. His charisma converted many people and in the written records the church scribes tell us that he used the three-leafed shamrock to share the idea of father, son and holy spirit make God. In Ireland, we have five types of 3-leaf-clovers - trifolium dubium (lesser trefoil), trifolium repens (white clover), medicap lupulina (black medick), oxalis acetosella (wood sorrel) and trifolium pratense (red clover). These 5 trefoils have easy to spot differences and most could be found anywhere on the Island but St Patrick never even mentions one of them. Think about this – Patrick never mentions Shamrocks or Seamrogs once, never. The Irish word for Shamrock is “seamrog” and it means “summer plant”. It grows in the wild all over the northern hemisphere, at high altitudes in the tropics and even in Africa and believe it or not even in South America. Many of these countries have snakes, some of which are huge, others deadly. The type of shamrock given by our Taoiseach to the US president is originally from Morocco, but don’t tell either of them. Because there is no mention of the three-leaf clover / shamrock in Patrick’s writings we can conclude that this claimed association is quite simply modern propaganda by his promoters. The first written reference to shamrocks in conjunction with St Patrick was made in 1571; over a thousand years after St. Patrick had passed over. The Seamróg became the badge of St Patrick’s Day in 1681 in America. The first written record of the shamrock being a symbol of the Catholic Trinity appears in 1727. So it can be easily understood that the myth of St Patrick had a shamrock symbol added to it only a few hundred years ago – it may be obvious to some that this was a commercialisation tactic as well as displacement of native practices honouring the Spring Equinox. The shamrock is not the official symbol of Ireland – this honour is reserved for the Celtic Harp. The shamrock now represents the culture of the Catholic Church hero of St Patrick. The shamrock became a symbol of rebellion against the oppression of Queen Victoria, who made it a capital crime (punishable by death) to wear the shamrock. This was probably the most influential reason for the worldwide adoption by Irish people and their sympathisers of the Shamrock as a symbol of Irishness. Legend has it that Saint Patrick drove all the snakes out of Ireland -- that they all went into the sea and drowned. There is no reason to believe there were actually any snakes in Ireland ever. There is no archaeological proof of snakes anywhere in Ireland at any time in the past. As this knowledge becomes more available we got fed the notion in to our mainstream consciousness that “this is probably an allegory for the driving out of paganism (snakes were a revered pagan symbol in some places)”. But this is just not so for Ireland, there were not and are not any snakes in Ireland so adding in bits of foreign snake lore is just disinformation. The famous mountain of Croagh Patrick or as its more commonly known in Ireland “The Reek” was a place of Pagan Pilgrimage long before the Christians became Catholic in 325ad. It is a round cone shaped mountain that looks like a pyramid from a distance. This holy mountain is quartzite with seams of gold throughout, it sits on the western seaboard overlooking the Atlantic Ocean and the setting Sun. Croagh Patrick aka the Reek was once know as Cruchan Aigli or in English; Eagle Mountain, it is 2510 feet above sea level. It has always been a holy place with pilgrimage on the last Sunday of July (during Catholic times), which is of course the wrong day as the Sun magic happens later in the month but the plan was to disconnect the people from the Sun and connect them to a foreign religion. This last Sunday of the month of July is now used because of traditional connection to Lughnasa, the harvest festival of Lugh, a bright god of the Tuatha De Dannan and in his day it may have been called Cnoc Lugh. Archaeological investigations backed up by excavations show that a hill fort with stone ramparts and dwellings and 30 hut sites are to be found on the top of the Reek. There are ancient cooking sites, megalithic tombs, standing stones, burial mounds, ringforts and today’s’ modern Catholic Church. I doubt that many Catholic Pilgrims know that this holy mountain was sacred to Lugh or before that to the great fertility god Crom. Its old name of Eagle Mountain may refer to the practice of excarnation, de-fleshing of the dead by carrion birds before burning of the remains and finally – internment of the remaining bones in an earthen mound. This practice was not uncommon in prehistoric times. It was on this holy mountain that St Patrick supposedly did his greatest magic – when he summoned a great host of loathsome and venomous creatures and then commanded them to cast themselves over the edge of the mountain, thus freeing the Irish countryside from all kinds of reptiles. This included dragons, snakes and all types of reptiles, none of which ever existed in Ireland. We are told that St Patrick did this by verbal command. The actual truth is that there were no snakes in Ireland and long after he was dead and his head was gone into Jesuit care somebody just added this trick to St Patrick’s name. It was as if the Pagan traditions were still so strong with the Lughnasa pilgrimage to the Reek in August that something had to be done to displace the old ways and such a fantastic story as dragon/snake banishing fitted the bill. It had to be long after St Patrick’s death or else everyone would know it was just made up fantasy. So, St Patrick’s famous mountain was the most revered place of pilgrimage to the Pagan God Lugh. Hang on a minute – there were no snakes to be banished and he never mentions shamrocks in his writings, no Pope would call him saint and his most famous site is a place of ancient Pagan Pilgrimage! Maybe there was something else that was being occulted from our view by those who would impose a foreign religion on the indigenous practices of our people. The Catholic Church displaced the Pagan Pilgrimage for Lugh with their last Sunday in July, but the holy mountain was seen as holy before they came and will be seen as holy when they are gone too. The conclusion offered is that this legend of Patrick was fabricated because he did not bring the Catholic faith or Christian beliefs to Ireland, he wasn’t Irish, it is highly unlikely that he could live to be 111 years of age when the usual life expectancy was maybe 40/50ish, he was given immense powers of travelling the entire country building churches and digging wells, killing dragons, snakes and reptiles that did not exist, burning 150 Druid books that did not exist, praying for old Arch Druids to die, killing or causing 800 Druids to be killed, having a female follower who was close to him disappear linked to a she-beast story, causing two princesses to die by his baptism, he never mentions shamrocks in his writings and he was given the totem of a shamrock long after he was dead, his title is not recognized by the leader of his own religion because no Pope would call him a saint and his fabricated importance was set up to displace a Pagan God. His most famous place was and is sacred to the Pagan God Lugh where we can still see incredible Sun and Landscape magic as our ancestors did. The reality today is that on the 17th of March many rivers are dyed green and people wear funny green hats and drink far too much alcohol especially green beer and pretend to be Irish. Do people make drunken fools of themselves on this day because they reckon that is what St Patrick did? He has out lived his usefulness to the Church that fabricated him and has become an alcoholic embarrassment for them – he is now a champion golem to excess commercialism, this is today’s true story of St Patrick. Saintly misconceptions - St. Patrick was not Irish, St George was not English and St Andrew was not Scottish. St. David of Wales is the only patron saint who is a native. Every so often one comes across articles which erroneously claim that St. Patrick’s nationality was Welsh, English or British in spite of the fact that Wales and England did not exist in St. Patrick’s time. He was a Romano-Briton meaning he came from a Roman family living in Roman colonial Britain. Similar maladroitness has led some to claim that St. Patrick did not bring Christianity to Ireland that this honour was achieved by Palladius. Therefore we should be celebrating St. Palladius Day on March 17th. In reality there were two St. Patricks and neither of them brought Christianity to Ireland! Here is the evidence. The great Irish historian T. F. O'Rahilly's "Two Patricks" theory was first posited in a lecture in 1942 where he playfully stoked controversy in order the initiate academic debate. O'Rahilly like many scholars before noted that a contemporary continental chronicler named Prosper of Aquitaine wrote that Palladius was sent as the first bishop of the Irish by the pope to Ireland in 431AD. Yet tradition tells us that Patrick was ordained bishop and sent to Ireland to convert the Irish in 432AD. O'Rahilly was intimating that the histories of two men had been confused and folded together. The Irish writers of the lives of St. Patrick say, that St. Palladius had preached in Ireland a little before St. Patrick, but that he was soon banished by the king of Leinster and returned to North Britain. Scottish church tradition holds that he presided over a Christian community there for around 20 years but the Irish Vita Tripartita (The Tripartite Life of Saint Patrick) states that he died at Cell Fine (thought to be modern-day Killeen Cormac, County Kildare), where he left his books, together with a writing tablet and relics of Peter and Paul. Alban Butler, citing Hector Boethius and Camden, says that he died at Fordun, fifteen miles south of Aberdeen about the year 450. Neither Palladius nor his mission is mentioned in official Roman sources and references to Palladius in later Irish documents derive either from the Chronicle Prosper of Aquitaine or from Book I of Bede’s Ecclesiastical History of the English People dating from 731AD, who also used Prosper as the source of his information. In another entry, written in the later 430s, Prosper appears to allude again to the mission of Palladius in his polemical tract known as Contra Collatorem. He refers to Pope Celestine as having made Britain ("the Roman island") Catholic, while making Ireland ("the barbarous island") Christian. This was in reference, in the first instance, to an earlier episode, in 429, when Pope Celestine dispatched Germanus, bishop of Auxerre, to Britain in order to combat a recent recrudescence of the heresy known as Pelagianism. That mission (again according to Prosper) had been undertaken at the instigation of a deacon named Palladius, who is undoubtedly identical with the man of that name sent to Ireland in 431. It is generally assumed that the mission to Ireland in 431 followed on from the one to Britain in 429, on the basis that the ecclesiastical authorities in Rome would probably have feared for the orthodoxy of any fledgling Christian community in Ireland because of its geographical proximity to the compromised Christians of Britain. It is assumed also that Palladius was, by whatever means, familiar with the situation in Ireland. When knowledge is absent we fill the gaps with assumptions but the reality is that outside of the references of Prosper of Aquitaine the information is not reliable. Historians consider Prosper of Aquitaine to be a more reliable source of information than the traditional views of the Irish or British because Prosper is neutral. He has nothing to gain and no national cause to promote in relation to these two individuals. So what exactly did Prosper write? He states in his chronicle entry for the year 431AD “Ad Scotum in Christum credentes ordinatur a Papa Celestino Palladius et primus episcopus mittitur”. Translated as “To the Irish believing in Christ, Pope Celestine sends Palladius as the first Bishop”. In plain language Prosper tells us that there were Christians in Ireland before the arrival of Palladius and Patrick, so neither of them were first to bring Christianity to Ireland! The work of a missionary from somewhere in the west of Britain was crucial to the conversion of Ireland to the Christian faith in the 5th centuryAD. He was a Romanised Celt called Patricius, son of a deacon and grandson of a priest. At the age of sixteen he was seized by an Irish raiding party near his home and brought across the sea to this country, where he was sold as a slave. After several years herding animals in lonely places, he managed to escape, and made his way to the Continent, where he studied for the priesthood. One night in his sleep he dreamed that a voice called to him to return to Ireland and to 'walk once more amongst us'. The compassionate and determined way in which he answered that mystical request has caused him to be known and loved ever since as Naomh Padraig, or Saint Patrick, patron of Ireland. We know this much of his life-story from one of the few documents written by Patrick himself, his Confessio. But, unfortunately, we know little else of the precise details of his actual mission, for he gives but very scant detail of either time or place. To him his work was principally a spiritual task, the gaining of souls for God, and thus he wrote in a private rather than an annalistic mode. Traditionally the dates 432 AD to 461 AD have been given for his mission in Ireland, and there is little doubt but that his feast-day, March 17, was the date of his death. Although there were some scattered Christian communities in Ireland before his arrival, it is clear that the impetus for the general change to Christianity throughout the land was due to him personally and to his work. Almost two hundred years after his time, two biographies of him were written, by monks called Muirchú and Tíreachán. Both of these were acquainted with the writings of the saint himself and also with some traditions concerning him. But they invented much, and borrowed material from the Bible and other early Christian literature in order to portray him as a special prophet sent by God to the Irish people. As a result, modern scholars regard these and later mediaeval biographies of the saint as having no historical value, except for the study of how legends develop around the name of a famous person. These fanciful texts do, however, have some curious accounts which seem to echo the preaching of Patrick himself. For instance, in the Confessio he contrasted the idols of the pagan Irish to the true 'light' of Christianity. He criticised in particular the belief in the divinity of the sun, claiming that 'its brilliance will not endure', and that those who worship it will be punished; and insisted instead on the worship of Christ, 'the true sun who will never perish, nor will anyone who does His will'. It is interesting to note that both Muirchú and Tíreachán tell a story of a fire-ordeal by which the saint showed the superior power of Christianity over that of a pagan druid. According to the story, a servant of Patrick emerged unscathed from the ordeal, being untouched by the fires of paganism, whereas his opponent was totally consumed by the fire of the Christian faith. In the Confessio, Patrick repeatedly refers to the great 'gift' he has received - meaning the conversion of the Irish people - and remarks that 'whether I receive good or ill, I return thanks equally to God'. Curiously, Muirchú relates a story of how a powerful pagan called Dáire sent a cauldron to Patrick as a gift, but the saint uttered no more than a single word of thanks. The pagan was incensed at this, and had the cauldron taken back, but Patrick expressed the same word of gratitude again. This caused the pagan to reconsider his position, and he gave the cauldron to Patrick to keep, as well as a site on which to build a church at Armagh. It is interesting to note that Dáire was an alternate name for the Celtic father-deity who was more usually referred to as the 'Daghdha', the bountiful god who gave to all from his great cauldron. Since Patrick preached that the Christian God was the true giver of good fortune, it may well be that this story sprang from a confused memory of such teaching. The most striking story from these early biographies describes Patrick as lighting the first Paschal fire in Ireland. As an account, it is full of high drama. We are told that the High-King Laoghaire had the custom of lighting a fire at the royal centre of Tara on a certain night and that nobody else should kindle theirs before he did so. Patrick had come to the hill of Slane nearby, however, and when Laoghaire saw a fire lighting there he was outraged and ordered that the transgressor appear before him. Then Patrick came to Tara as a great Christian hero, and the High-King and all the royal forces were confounded by his miraculous power. Several great contests between Patrick and the pagan druids are described, contests in which dramatic changes of climate and environment are brought about by magic and miracles. The saint, of course, triumphs in all of these tussles, which occur in the presence of the High-King at Tara and of all the royal court. The substance of these narratives was borrowed from passages in Christian literature, and it is clear that Patrick was being portrayed as a kind of new Moses triumphing over the Irish potentates, who have all the marks of the Pharaoh and other Biblical tyrants. Indeed, just as Moses caused water to spring from rock at a stroke of his staff, so Patrick is said to have caused holy wells to spring up at different places so as to facilitate the baptism of his converts. The earliest biographies described the mission of Patrick as taking place in the northern half of the country, but around the 9th century a third account of him was written which extended his mission to the south. As well as the bishopric at Armagh, it was further claimed that he founded the bishopric at Cashel, which rivalled the former in prestige. There is little doubt but that all such accounts of his activities were closely connected with the claims and counter-claims of the two leading power-groups of the period, the Uí Néill dynasty in the north and the Eoghanacht dynasty in the south. In the 9th century literature we also find the beginning of a celebrated tradition concerning St Patrick. This claims that he spent forty days and nights fasting on top of the mountain of Croagh Patrick in Co. Mayo, and that God became worried lest he might die and thereby leave his mission unaccomplished. The Supreme Being therefore asked him to abandon his fast, but Patrick would only do so on three conditions - that the Irish people would not live permanently under oppression, that the country would be submerged seven years before the end of the world and so be spared the final devastation, and that Patrick himself would be allowed to judge all the Irish people on the Last Day. This tradition, which has Patrick as the special champion of the Irish, persisted down through the centuries and gave consolation to the people in times of misery and distress. The best-known of all traditions concerning the saint seems not to have originated until the 11th century, when it first appears in biographies of him. This is the belief that he banished the snakes from Ireland. The indications are that this idea was suggested by the many accounts of how the saint banished the 'demons of paganism', and that it was borrowed specifically from a similar motif in the biography of St Honoratus, founder of the island-monastery of Lérins in France where Patrick is said to have studied. The fact that there were no snakes in Ireland was well known from antiquity, and indeed was referred to by the Graeco- Roman writer Solinus two hundred years before Patrick was born. Later still is the association of the shamrock with him. It was customary in Ireland to use the shamrock as an aperitif, and the placing of some sprigs of it in a toast was no doubt the origin of 'drowning the shamrock on the feast day' of the saint. The actual wearing of the shamrock as a badge on St Patrick's Day is hardly more than a few centuries old, but old enough for some creative mind to notice that its trefoil stem offered a neat parallel to the Christian mystery of the Trinity. Thus we are told that Patrick, being exasperated in his efforts to impress this doctrine on his Irish audience, stooped down and picked up the shamrock, explaining that just as three leaves can spring from one stem so also there are three persons in one God. The Irish people, however, have not confined their fascination with St Patrick to environmental and theological legends. Down through the centuries they have invented many other stories of a curious and sometimes humorous nature. He is said, for instance, to have met survivors of the epical heroes of old Irish tradition, the Fianna, and to have obtained baptism posthumously for their fellows. It is also claimed that he blessed and cursed various parts of the country, depending on the preferences of the storytellers, and that he ordered that tavern-keepers should always give extra value for money on the day of his feast! So Patrick, the slave-boy forcibly brought here from abroad, has become to many generations of Irish people the epitome of all that they considered best in their culture - a courageous and protective figure, proficient in miracles, scrupulous in teaching, but full of human kindness and with his own puckish sense of humour. St Patrick's Day has always had a special meaning for the Irish. The national holiday, which falls on March 17, is an occasion of great celebration not only for the native Irish themselves but also for many- thousands of people of Irish background throughout the world. While the principal parade in Ireland is in Dublin, many cities and towns throughout the country hold parades. Parades and marching band competitions have become the order of the day, and participants come from all over the United States, Canada, Britain and Continental Europe, to join in the festivities. Word of the fun has spread to such an extent that nowadays the period of celebration has increased to a week. ST. PATRICK AND THE DRUIDS. Let us see what the biographers of St. Patrick have to relate about the Druids. the earth opening his mouth after a most strange manner devoured the magitian, who descended alive downe to hell." Again:--"A certain magitian that was in high favour with the King, and whome the King honoured as a god opposed himself against S. Patricke, even in the same kin that Simon Magus resisted the apostle S. Peter; the miserable wretch being elevated in the ayre by the ministery of Devils, the King and the people looked after him as if he were to scale the heavens, but the glorious Saint, with the force of his fervent prayers, cast him downe unto the ground where dashing his head against a hard flint, he rêdred up his wicked soule as a pray to the infernnall Fiendes." The Triptartite Life of St. Patrick relates:--"Laeghaire MacNeill possessed Druids and enchanters, who used to foretell through their Druidism and through their paganism what was in the future for them." Coming to certain town, the Saint, according to history, "found Druids at that place who denied the Virginity of Mary. Patrick blessed the ground, and it swallowed up the Druids." The book of 1625 is the authority for another story:--"Two magitians with their magicall charmes overcast all the region with a horrible darkness for the space of three dayes, hoping by that meanes to debar his (Patrick's enterance into the country." Again:--"Nine magitians conspired the Saint's death, and to have the more free accesse to him, they counterfeited thēselves to be monks putting on religious weeds; the Saint, by divine information, knew thē to be wolves wraped in sheeps cloathing; making, therefore, the signe of the crosse against the childrē of Satan, behould fire descended from Heaven and consumed them all nine." He is also reported to hay caused the death of 12,000 idolaters at Tara. And all the people will answer--'Amen! Amen!" The authoress of Ireland, the Ur of the Chaldees, ventured to write:--"When the Apostle of Ireland went there, the people believed him, for he taught no new doctrine." She thought Druidism not very unlike Christianity. Dr. O'Donovan, upon the Four Masters, observes:--"Nothing is clearer than that Patrick engrafted Christianity on the pagan superstitions with so much skill that he won the people over to the Christian religion before they understood the exact difference between the two systems of beliefs; and much of this half pagan, half Christian religion will be found, not only in the Irish stories of the Middle Ages, but in the superstitions of the peasantry of the present day." Todd sees that worldly wisdom in "dedicating to a Saint the pillar-stone, or sacred fountain." It is not necessary to discuss the question as to the individual Saint himself, around which so much controversy has raged. They who read theology between the lines of old Irish history may be induced to doubt whether such a person ever existed, or if he were but a Druid himself, such being the obscurity of old literature. St. Bridget's early career was associated with the Druids. A miracle she wrought in the production of butter caused her Druidical master to become a Christian. Colgan contended that St. Patrick, by "continually warring with Druids, exposed his body to a thousand kinds of deaths." In The Guardsman's Cry of St. Patric, which declares "Patric made this hymn," we are informed that it was "against incantations of false prophets, against black laws of hereticians, against surroundings of idolism, against spells of women, and of smiths, and of Druids." The Annals of the Kingdom of Ireland by the Four Masters mentions a number of stories relative to Irish Druids, then believed to have once ruled Erin. St. Patrick was a youthful slave to Milcho, a Druidical priest. Gradwell's Succat, therefore, says, "He must often have practised heathenish rites in the presence of his household, and thus excited the horror of his Christian slave." St. Columba, the Culdee, was much the same as St. Patrick in his mission work, and his contests with Druids. He changed water into wine, stilled a storm, purified wells, brought down rain, changed winds, drove the devil out of a milk-pail, and raised the dead to life. All that tradition acknowledged as miraculous in the Druids was attributed equally to Columba as to Patrick. darkness came. But the Saint put off, and "the vessel ran against the wind with extraordinary speed, to the wonder of the large crowd." The Saint wanted the Druid to release an Irish female captive, which he declined to do. But, says Adamnan, "an angel sent from heaven, striking him severely, has broken in pieces the glass cup which he held in his hand, and from which he was in the act of drinking, and he himself is left half dead." Then he consented to free the Irish girl, and Columba cured him of the wound. My comment - Even if only one claim of murder is true = then Patrick could not be a saint. 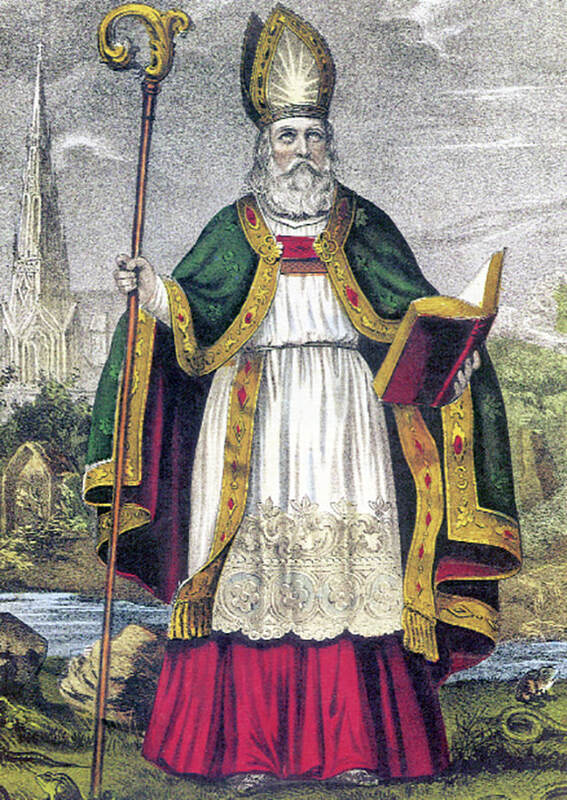 (top picture from: http://www.historyireland.com/st-patrick/st-patrick-the-legend-and-the-bishop/ ) interesting story as well.